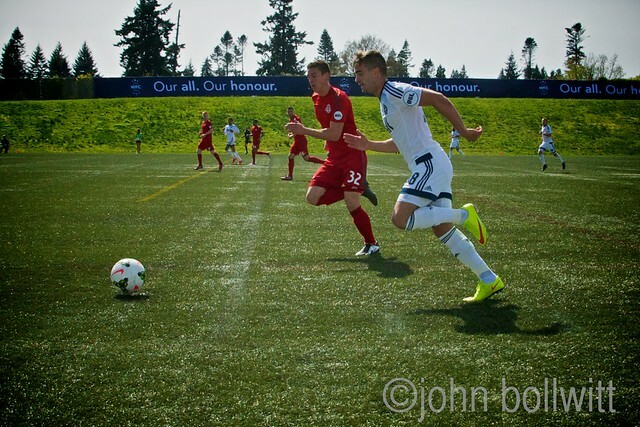 Vancouver Whitecaps FC 2 (“WFC2”) hosted their inaugeral home match at UBC’s Thunderbird Stadium yesterday, resulting in a 1-1 tie with Toronto FC 2. 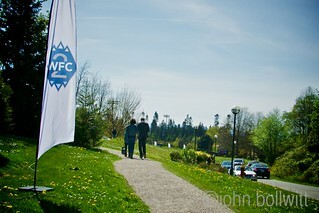 Whitecaps FC 2 is the Whitecaps’ own United Soccer League (“USL”) team and over 3,200 fans came out to cheer them on, including John and I as we were given access to document the day. 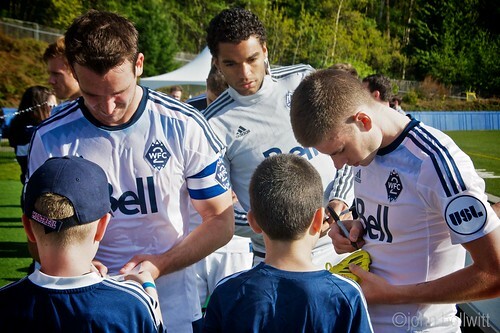 There was plenty of sunshine, family fun, and action on the pitch — it was the perfect way to spend a Sunday afternoon. 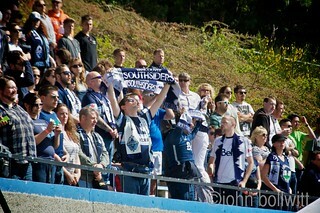 Families and supporters alike appeared to have a great time at the match. 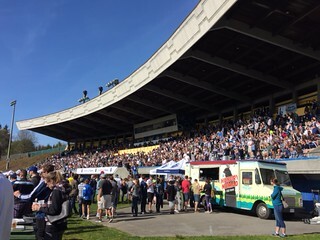 There was a band playing, parallel lineups at the balloon twisting and face painting stations, food truck fare, photos with Spike, and autographs from the Whitecaps’ captain Pedro Morales — about which I overheard a little girl gushing to her family after the match when we were at a restaurant nearby. 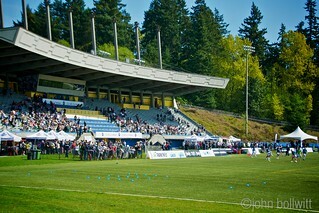 Seating at WFC2 matches is general admission; however, there are designated areas. The family friendly area is located in the north side of the grandstand and the supporter area is located in the south side of the grandstand. 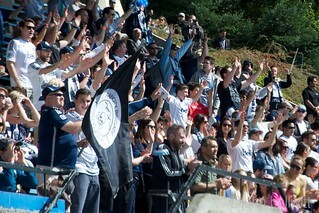 When play began, members of Vancouver Whitecaps supporter groups Curva Collective, Raincity Brigade, and the Southsiders chanted and sang anthems, creating an even more festive atmosphere. 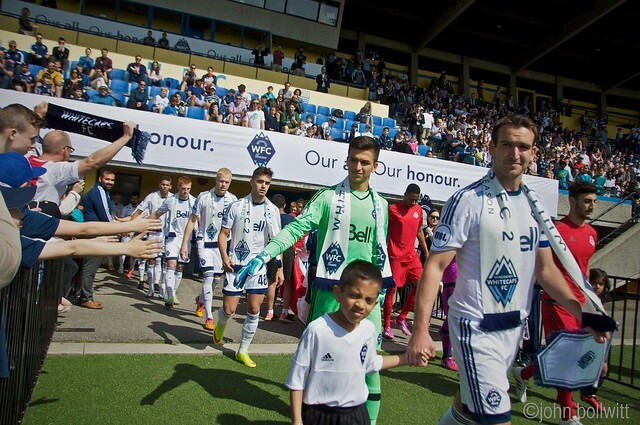 The average attendance for USL games in 2014 was 3,114 so this was a great showing for Vancouver. The United Soccer League (USL) is a professional soccer league based in North America. It’s currently the third tier of soccer in North America, but is considered to be the strongest men’s professional soccer league on and off the field below and in support of Major League Soccer (“MLS”). In 2013, USL began a groundbreaking, multi-year partnership with MLS that featured individual team affiliations, inter-league play, and the opportunity for MLS clubs to field a second team in USL. From the perspective of MLS teams, the goal is to aid the development of young players by providing them more minutes in a competitive club environment. MLS has mandated that each of its clubs either start their own team or reach an affiliation agreement with an existing USL club by 2015. 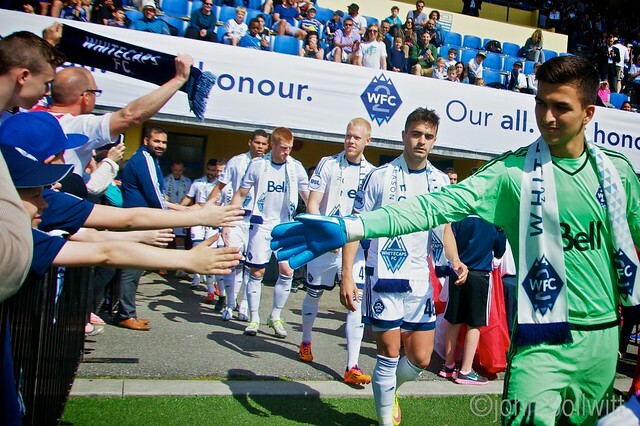 Whitecaps FC are the seventh MLS side to officially launch a USL team for the 2015 season. The others are LA Galaxy (LA Galaxy II); Real Salt Lake (Real Monarchs SLC); Seattle Sounders FC (Sounders FC 2); Portland Timbers (Timbers 2); Montreal Impact (FC Montreal); Toronto FC (Toronto FC II). 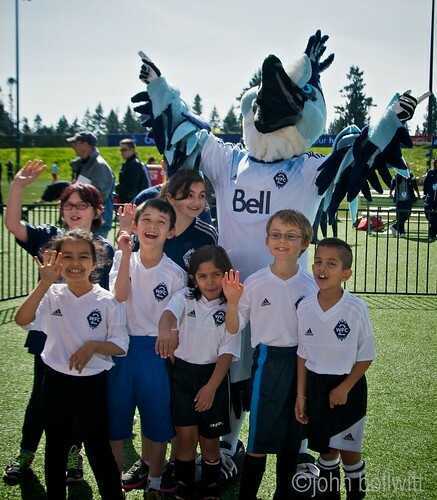 With Whitecaps FC 2, there are now a total of 24 teams confirmed for 2015. In addition to the MLS clubs, other expansion teams include Austin Aztex, Charlotte Independence, Colorado Springs Switchbacks FC, Louisville City FC, Saint Louis FC, and Tulsa Roughnecks FC. In 2015, each team will play 28 matches (14 home, 14 away) and have the opportunity to qualify for the USL playoffs. 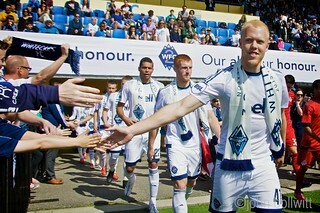 Prior to joining MLS in 2011, the ‘Caps spent a total of 11 seasons in the USL (between the USL A-League and USL First Division), winning league championships in 2006 and 2008. They also previously operated a U-23 PDL team and a W-League side. 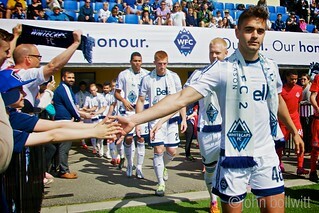 Whitecaps FC 2 will feature first-team players from Vancouver’s MLS team, players signed to USL contracts by Whitecaps FC 2, and players from Vancouver’s Residency program. USL allows teams to carry as many as five Academy (aka Residency) players on their roster. 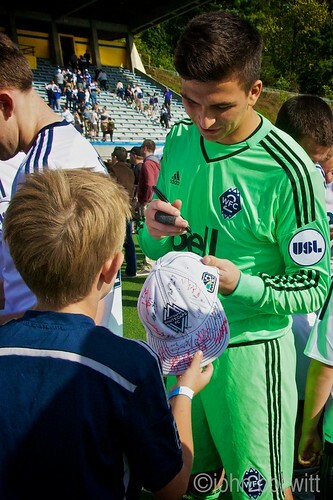 Among the MLS players who have already featured this season are goalkeepers Marco Carducci and Paolo Tornaghi, defenders Christian Dean, Tim Parker, and Ethen Sampson, midfielders Kianz Froese and Ben McKendry, and striker Caleb Clarke (who scored the goal for WFC2 on Sunday). 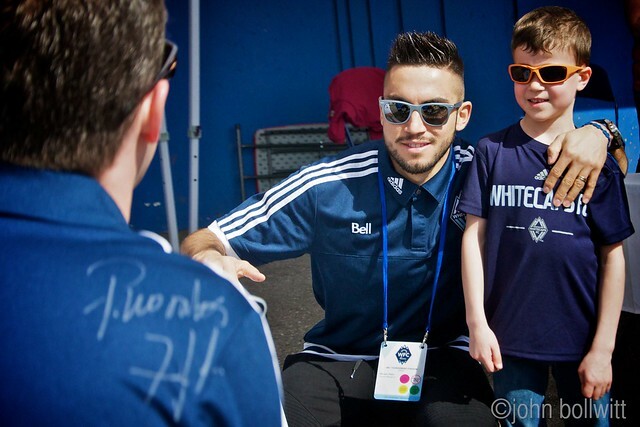 Tickets and family packs are available now for all WFC2 home matches. 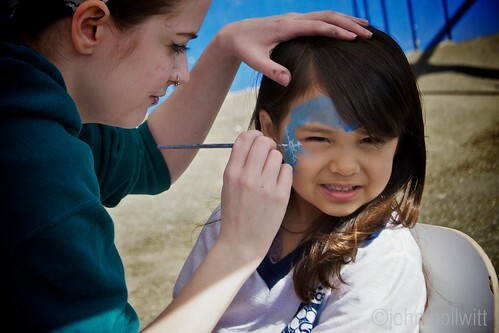 Single tickets are $15 and family packs (family season passes) start at $199. Group tickets are just $11. 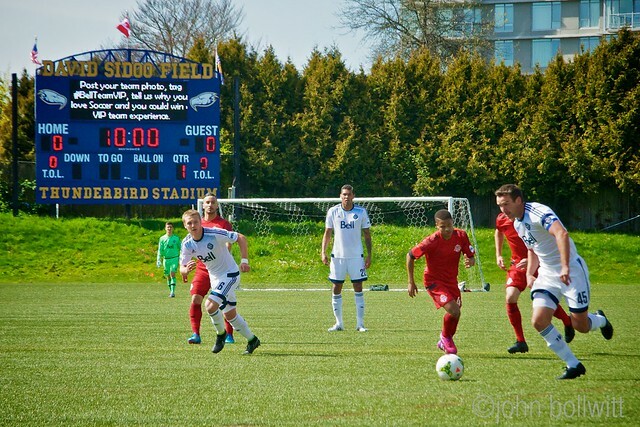 The next home match is Sunday, April 26, 2015 at UBC Thunderbird Stadium against Sounders FC 2, followed by OKC Energy on May 17th, Real Monarchs on May 24th, and Arizona United SC on May 31st. Find the full schedule online (through to September 2015) and be sure to get your tickets!